Once again, I am very humbled and honored to be a featured artists with the Saint Louis Art Fair. I was pleasantly surprised when Christina Chastain with the Higher Education Channel TV, contacted me to do an interview at the farm. My focus at the show this year will be on Heritage Breed farm animals in danger of extinction. I am in the process of visiting Missouri Farmers raising rare breeds of livestock and poultry. It is my goal to raise awareness that we have animals and small farmers right here in Missouri in need of our help. It's an honor to bring this work to the Saint Louis Art Fair. What a wonderful opportunity to share my message and my art. The Saint Louis Art Fair runs September 7-9, 2018 and will be held in the heart of downtown Clayton, MO. ​Very proud to have had my booth/art work featured in a promotional video recapping the 2017 Art Fair in St. Louis. This was my first time to show there as a full fledged artists, and what an amazing experience it was! Not only was I juried into the show which has over 1000 applications, but I also won a 2nd place award! Truly more than I could of dreamed of. Top it off, because I am an award winner, I have been invited back to show in 2018....so I'll see you at the fair! 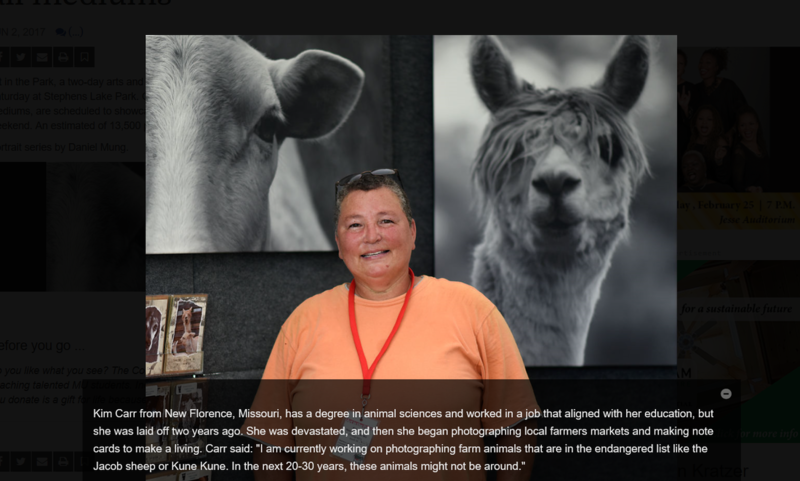 A journalist for the Columbia Missourian featured a photo of me in the Missourian during the annual Fall Into Art show in Columbia, MO as I visited with customers. ​In September I was invited to bring of few of my pieces to the newsroom at KPLR in St. Louis. They were doing promo spots for the upcoming St. Louis Art Fair and I was one of the lucky artists selected to showcase my work on television. 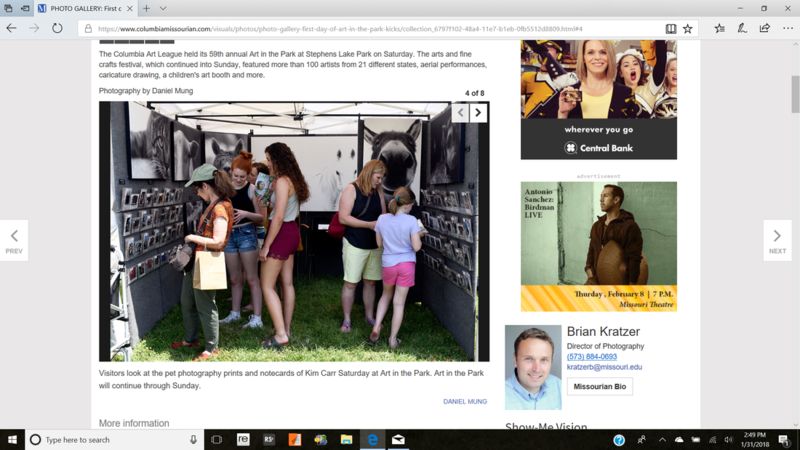 ​At Art in the Park I was lucky enough to have two images of booth featured in the Missourian. Both images were taken by Daniel Mung a photo journalist student at Mizzou completing a summer internship with the paper. Art in the Park, a two-day arts and fine crafts festival organized by the Columbia Art League, officially kicks off on Saturday at Stephens Lake Park. Over 100 artists from across the United States, all with different styles and artistic mediums, are scheduled to showcase their work. Several showed up Friday to set up their booths for the coming weekend. An estimated of 13,500 people attended the festival last year. Portrait series by Daniel Mung. 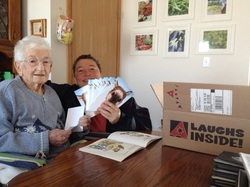 As of December 2012, Avanti Press Inc. has leased one of my most popular images, "Sophia Smiling" from me for use in their card line for the next five years. These note cards can be found nationwide at retailers that carry Avanti Press cards. Please visit http://www.avantipress.com for locations. under their "Seriously Funny" section. I am very happy to say that I have successfully completed the two year Emerging Artist as Entrepreneurs Program with the St. Louis Art Fair in Clayton, MO. Noted as one of the top ten art fairs in the United States, this program is an excellent opportunity for those wishing to learn first hand the ins and outs of life as a working artists. I wholeheartedly endorse this program and will be forever grateful for this experience. 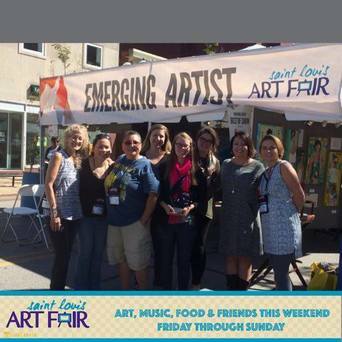 In September 2015 I was fortunate to show at the St. Louis Art Fair along with my fellow emerging artists: Susan Zimmerman, Lizzie Kim Tran, Kim Carr, Amber Gregory Adkins, Joyce McCown, Emily Drenovsky, Jenna Elise Draves & Stacy Nikodymm Krieg. Congratulations to Joyce McCown for being recognized with the Emerging Artists Jury Award. Emerging Artist as Entrepreneurs Program provides an opportunity for up and coming artists to jumpstart their careers by learning more about selling, pricing and displaying work, copyright laws, and the Art Fair Industry. Participants also receive the chance to sell their work at one of the top art fairs in the nation. 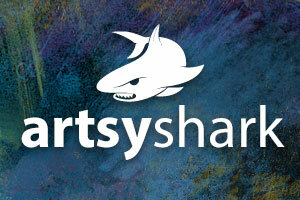 Artsy Shark specializes in featuring artists, showcasing them through individual articles that present their portfolios and tell their stories. I was featured in their November 2015 Photography Spotlight. Through the vision and support of Des Peres Hospital in St. Louis, Missouri, Art Saint Louis is pleased to join with the Foundry Art Centre, MySLArt.org, and the St. Louis Artists’ Guild in presenting one of the largest collections of original, locally-made art in the St. Louis metropolitan area. 1) Create a dynamic, aesthetically rich and engaging environment through a multitude of artworks spanning a wide range of styles and expressions, to spark curiosity, elevate and enliven the intellectual and emotional wellbeing of hospital visitors and staff. 2) Celebrate the work of local artists and further develop their audience by creating a new outlet through which artists can impact our community. 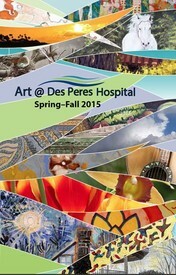 Art @ Des Peres Hospital Spring-Fall 2015 exhibition opened May 11, 2015 and features 118 original artworks in a variety of media by 18 St. Louis regional artists representing the four partering artists' organizations. The exhibit continued through November 1, 2015. This rotating exhibit is free and open to the public during regular Hospital visiting hours: Daily from 9 a.m. to 9 p.m.
Hannibal, MO - Eight members of the Missouri Artisans Association/Best of Missouri Hands organization have been selected to have their work displayed at the Missouri Governor’s Mansion as part of an ongoing partnership titled Best of Missouri Hands at The Mansion. 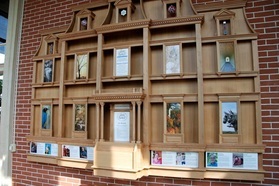 Each year a different medium is selected to be featured. Invited to display their work in 2014-2015 are Best of Missouri Hands Juried Members and photographers Todd Tuttle of Poplar Bluff, Faith Bemiss of Sedalia, Hilary Hitchcock of St. Louis, Gary Winn of Blue Springs, Lori Purk of St. Louis/Clarksville, Martin Spilker of Bethel, Harry Enderle of Boonville, and Kim Carr of New Florence. 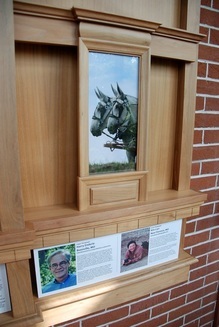 I am very proud to have my image of two Missouri Mules, Pat & Jane on exhibit at the Governor's Mansion, especially since the mules is our official State Animal. Check out the Fall 2013 Issue of The Arts Live online magazine. I'm honored to have my photography featured in the "Studio Visit" segment, page 30. This online publication covered all aspects of the local art scene. KTVI FOX2 NEWS: Sophia Smiling makes the news in preparation for the St. Louis Art Fair in Clayton, MO.